Ever wanted to add WiFi functionality into your project? Looking for flexible solution that can connect to existing WiFi network be it adhoc or infrastructure mode, using WEP, WPA or WPA2 security? This WiFi module from Roving Network, with the added advantage of XBee form factor, is a good fit to above needs. Easily configured to securely connect to existing WiFi network. Once configured, it will remember the WiFi connection parameters and will connect to the configured WiFi network automatically. Worthwhile mention is the module built in RTC. Together with its WiFi capability to connect to internet and synchronize with network time server. Thus complementing Arduino missing real time clock functionlaity. Imagine being able to create a data logger that keeps time as well as synchronize accurately recorded log to the cloud! It works with existing XBee accessory including XBee USB Adapter, XBee Shield and various DFRobot shield that come with XBee support. An inexpensive WiFi addition to those who already invest in XBee hardwares! *Notes: This step are for specific hardware bought from H&T online shop. Applying bellow step on different set of hardware are not advisable and may cause damage or bricking the device. Please be careful! As in the last XBee article, we are going to configure the module using XBee USB Adapter. However, instead of X-CTU. The software to be used is called Tera Term. The configuration step is more to the tune of sending raw command instead of using GUI as in the case of XBee. However, it is easy and a very informative process. *Important: Be careful not to insert WiFly module in reverse in to the XBee USB Adapter. Doing so might damage the module. Connect XBee USB adapter to your development machine using USB cable and plugged in the Wi Fly module. It is a good idea to double check the detected comport number in Device Manager. 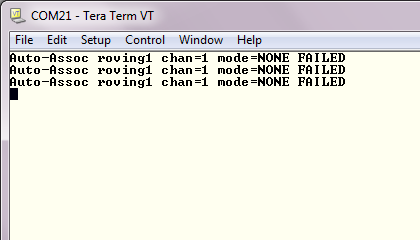 Otherwise, Tera Term is good enough to display list of connected comports. Open up Tera Term. File >> New Connection or press ALT-N. Choose Serial and the right port to connect to. Press OK to proceed. Observed that upon power up, red and yellow LED of the Wi Fly module is blinking. Observed also that the just opened serial terminal is reporting unable to connect to the network. This is because Wi Fi network connection parameter is not configured yet. To do this configuration, we need to be in command mode. Simply type "$$$" character in the terminal window to enter command mode. No need to press ENTER. Take note that that command mode can be used to set parameters as well as query a lot of information. Just for kicks, Try get wlan and get ip to see the parameters that we are going to change shortly. To set WiFi connection using WPA2 issue the following command. Take note that for WPA2, only AES encryption setting is supported on the router. Execute command to save above configuration. Otherwise, the setting will be gone upon power lost. After that reboot. The module will than restart and establish WiFi connection with the WiFi router. Note the IP address as we will need it in the next steps. Development machine must be connected to the same WiFi router to test. Open up windows shell and ping ip address from previous step to verify. 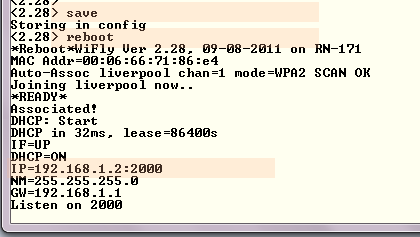 To demonstrate that the module is now connected to WiFi network, telnet to the IP address. Either using windows shell or Tera Term. When telnet is successfully connected, *HELLO* will be displayed. Whatever typed in the telnet terminal will show in serial terminal window used during above configuration steps. We are done with configuration! 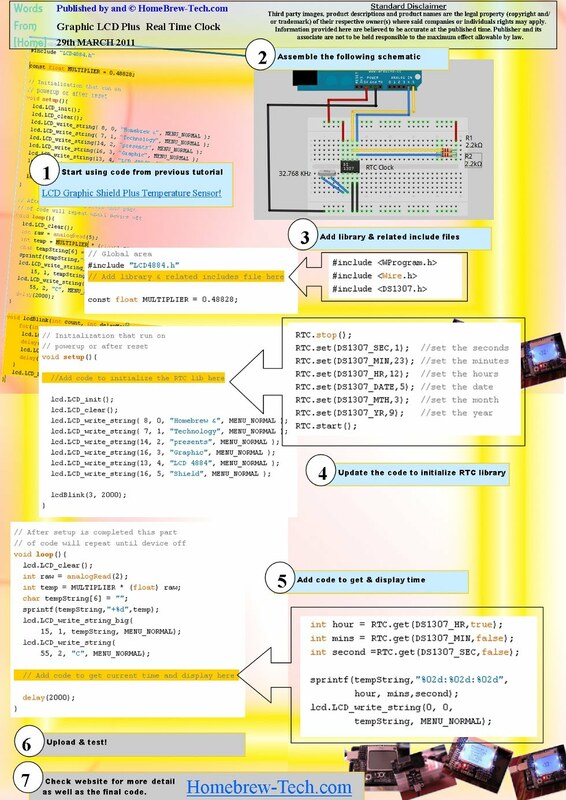 As usual, here is a very simple test code for Arduino. The codes it self is based on SerialCallResponse sample code (Arduino IDE >> File >> Examples >> Communication >> SerialCallResponse). During configuration step, we have seen how the WiFly module can be accessed using telnet over WiFi network. We are just going to extend this functionality by having Arduino monitor input sent through telnet session for ON or OFF command set. In a way, it is a demonstration of turning LED over telnet! Being base on XBee means that communication between Arduino and the WiFly module is serial. I.e. whatever written to Arduino RX pin will be received by the module TX pin and vice versa for the module TX pin and Arduino RX pin. The beauty of using shield is that hardware is abstracted. Just plugged in WiFly module on top of a shield with XBee connector and stack the shield on top of an Arduino micro controller board. No need to worry about what RX pin connected what else TX pin :D. It is good to know that the code will just work! Perhaps one day we will delve deeper into this hardware complexity. Definitely that day is not today. Here is the hardware requirement, or at least what used for this particular coding activity. An Arduino micro-controller board. Uno R3 will do nicely. DFRobot IO Expansion Shield just to use something that is lying around and available to me. DFRobot XBee Shield would do it. In fact, nowadays DFRobot have a lot of shield with XBee support. Any of this shield will do! WiFly WiFi module in XBee form factor. Connect Arduino board to your development machine (PC or notebook) using USB cable. 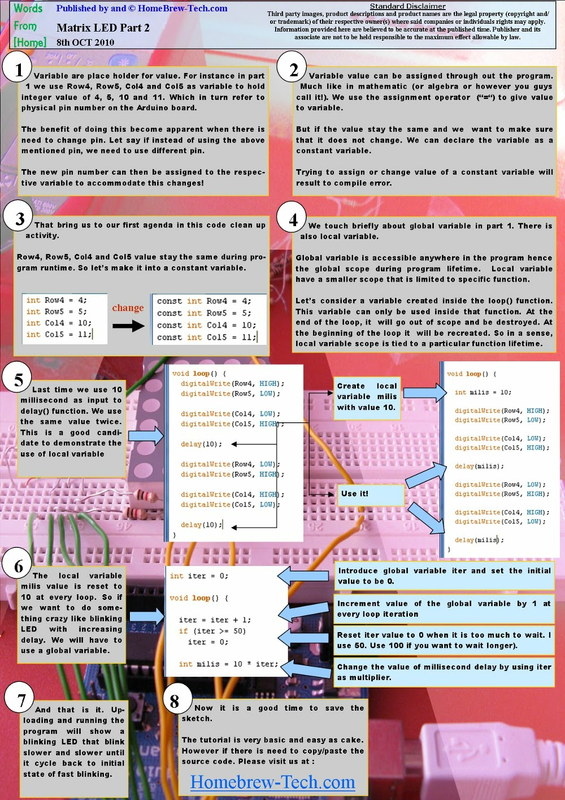 Write the codes, compile and upload it to the board. Mount WiFly module on top of the shield and stack the shield on top of Arduino. If needed, power down Arduino board before stacking the shield. Just being careful to avoid accidental shorting whenever board is powered up. If there is need to reprogram the Arduino board, unplug the shield or the WiFly module before reprogramming. In summary, the code waits for certain ASCII character which will then turn on or off built in LED on pin 13. DFRobot IO Expansion shield does duplicate the built in LED pin. Otherwise, it will be hard to see the LED on or off status. Take note of the cmd global variable, basically it keeps track a line of command. The setup part of the code simply do the necessary to initialize serial communication and set digital pin 13 as output for turning the built in LED on and off. The establishContact() function is sort of the place where communication hand shake should happen. Here we see that establish contact actually is not doing anything much. Remember that this code is running on Arduino, i.e. the Atmega micro controller chip. The mcu simply send ASCII character A through the serial connection until there is a reply from the other side. The other side, in this case is our WiFly module. Which is relaying the character over WiFi network connection. The main loop just happen again and again as long as the hardware is running. So it repetitively wait for a byte of data available to read from the WiFly module serial connection. When there is such data, it is appended to the cmd global variable, which is a string object. A byte of data is just another way of saying a character. So you can imagine cmd string is being built a character at a time. As the cmd string is being built, it is being checked whether it is a command or not. whether it is a line ended by carriage return and line feed character (CR = \r and LF = \n). whether it is a valid command. Which in this case ON command (turn on LED) and OFF command (turn off LED). Depending on the command, LED connected to digital pin 13 is going to be turned on or off. This function simply process commands as it is detected and only once. After that it simply clear the cmd string. So that the global variable will start fresh the next time. To be filled up by another series of character that will build the next command. What is the fastest way to test the Ethernet Shield? We will look into that in this article. As well as exploring a little bit of serving HTML and basic information about HTTP protocol. PC or notebook with Ethernet port. Note that, direct Ethernet connection usually require a loop back Ethernet cable. Have not tested this, but it is possible to connect both PC and Ethernet Shield to a router. Since modern router do not care and auto detect normal cable and loop back cablesdfadf. The Uno is going to be connected to PC using USB cable. Stack Ethernet Shield on top of Uno. Connect Ethernet Shield to PC Ethernet port using Ethernet cable. At this point the link is not yet fully operational since IP need to be set on both PC and shield. Open up Arduino IDE. It is good idea to double check that the board and serial port is correctly set in the Tool menu. Look for the following code which set the Ethernet Shield IP. Change the IP if required, for instance if there is an IP conflict. PC and Ethernet Shield need to be in the same subnet to be able to communicate. In windows, open up command prompt and use ipconfig command to check this. Note that usually there are more than one network interfaces. Look for "Local Area Connection" or some such. 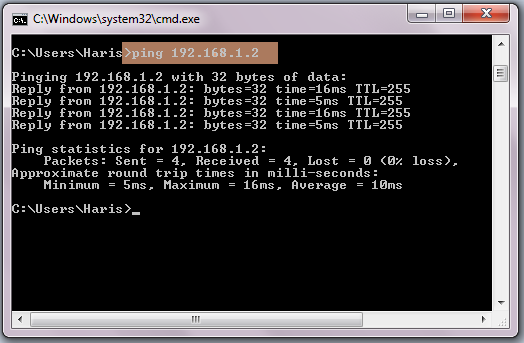 As in IP setting for Ethernet, the IP for PC should start with 192.168.1.x. If not, change the IP. In my case it is set to 192.168.1.178. Double check using ping command in command prompt. Should be able to ping the Ethernet shield IP successfully. Go back to Arduino IDE where the WebServer example sketch is loaded and upload the sketch. Open up browser and browse to the Ethernet shield IP. 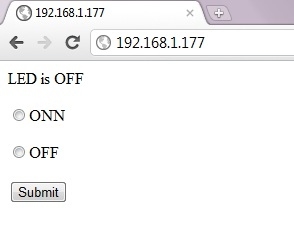 Simply type the IP in browser address box and press enter. You should see the following result. Read the WebServer sketch code to understand what is going on. In short, the sketch (which is the server) respond to browser (which is the client) HTTP request by sending HTML page. The HTML page content is generated by reading analog input pins value (which are floating values since we do not do anything with it). HTTP is a topic worth a book by itself. However the following reference should give some basic idea. 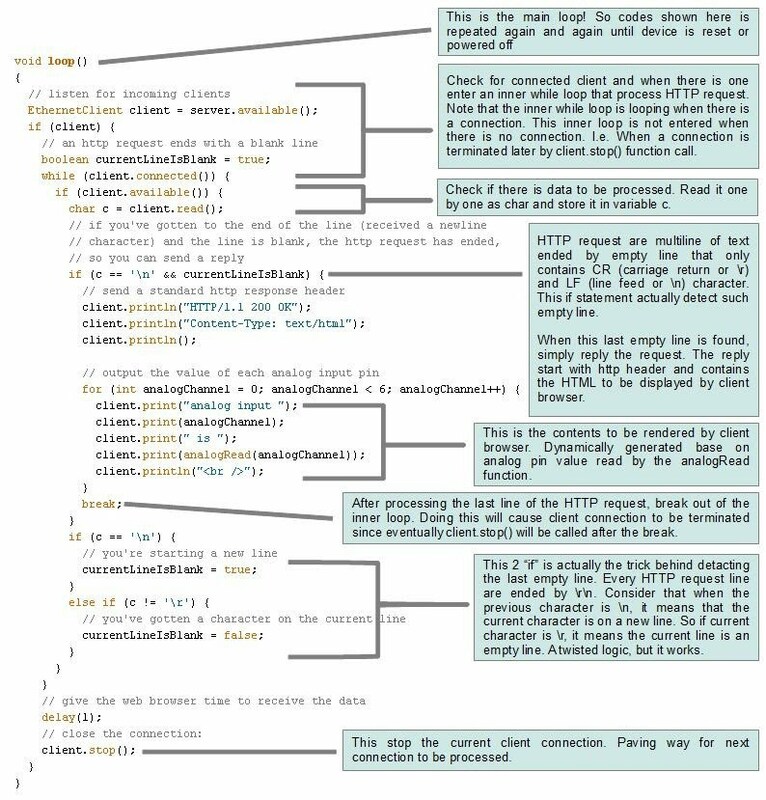 To gain better understanding, let's modify the sample code so that we can have a peek into HTTP request sent by browser. We are going to use Arduino IDE Serial Monitor functionality to achieve this. (1) Add Serial object into the setup part of the code. Refresh browser and observe HTTP request displayed in Serial Monitor. 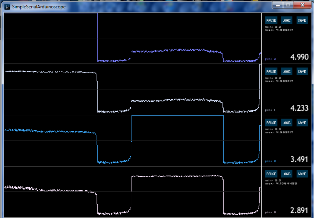 Should see the following screenshot or Serial Monitor window. Let see interesting part of the code before we move forward. This is the part where HTML content is dynamically generated and sent back to the client. The first 3 line actually generate http header while the rest of the code loop through all analog port to read their value. This short example does not really observe proper HTML structure (note the missing <header> and <body> tag). But it do the work. This article will continue in that spirit and it is up tp the reader to properly include this in their consideration. (1) Let's modify the code. Start by totally deleting the for loop. Instead, we will read digital pin 8 and display the value as ON or OFF in the browser. (2) Next add HTML code to generate a form with two ON/OFF radio input and a submit button. Save and upload the code. Refresh the browser and the result should look as on the right. Now we have the user interface needed to turn on and off something. However clicking the submit button will not do anything yet. Code need to be written to process the HTTP request and then set digital pin 8 to high or low. (1) First of all we need to set digital pin 8 as output pin. Do this in setup. (2) The sample code read a character one by one. We need a buffer to hold this char. So declare the buffer as an empty string. (3) After each character is read, simply append it to the end of string buffer. (4) Clear the string when there is new line. (5) & (6) This is where we check status input. Simply look for "GET /?status=1" or "GET /?status=0" in each line of HTTP request. Now is a good time to refresh the browser and test the UI again. Selecting the status and clicking submit button should result to LED turning on or off. Review the complete source code if you have trouble following above steps. Web-controlled Window Air Conditioner Using an Arduino. Interesting read and a good next step after going through with above tutorial. *Update: Both Uno R3 and Ethernet Shield SD R3 are now available from the online shop. A bundle of both or other such promotion should appear shortly. 4 What is New in R3 Then? I have been holding this two weird (yet no less than the latest) version of Arduino and shield for about a week now. Playing around with it as well as exploring their irregularity. As distributor, R3 version of Arduino was made known to H&T back in November 2011. But only now I get the chance to play with them. Fear not, might be a bit behind schedule, but perhaps shine more in completeness. Right here there are both Uno R3 and R3 shield. As well as previous version of Uno to compare. Well, in a box the new Uno (let's just called it Uno R3 henceforth) does not really look any different. The surprise is that, the new Ethernet Shield (let's just called it Eth R3 henceforth and be merry ;D) come in a box much like Uno but larger. Which also means you get free stickers, as well as a big thank you note. Buy it together with Uno and you get more of these! The Uno R3 packaging is the same. How to tell between R3 and older version? Well to be honest, there was never Uno R1. The first Uno is simply just Uno. But that bring up the question about R2. Also, the most curious will even ask why use R as in revision and not V as in version. Using revision instead of version implies that small changes is made to the board, hence the R. To continue with this reasoning, R2 is very small revision that does not warrant much celebration. So it was silently release to the market. But R3 is special, ain't it? Otherwise we will not be reading this article. I am going to write more about this in future article. However let's shoot straight directly to the concern of physical compatibilities. After all, there are additional pins for the new revision. 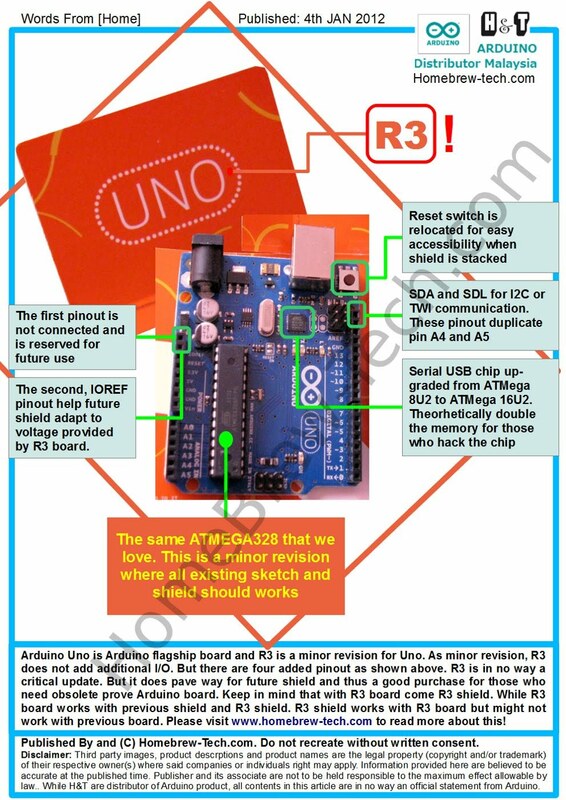 Do remember that R3 applies to Arduino board as well as shields that want to be fully compatible with the R3 revision. In case 1, it is a given that older revision of shield will not have the additional pins as in R3 revision. The shield will work as intended. Additional note about stacking shield. If there is mix between R3 and non R3 shield, would be good idea to put non R3 shields on top. Since non R3 shields do not pass additional pins interface to top shield. In case 2, both R3 board and R3 shield as intended. In case 3, is what happen when previous revision board is used with an R3 shields. Physically, the extra pins are not really compatible with older revision board. Not really! That does not looks good, does it? Well, we are in DIY field. As work around, it would be easy to bend the pins using pliers. Or worst case scenario, to cut it as nice as possible. IMHO, it will slowdown adoption of new R3 shield by third party manufacturer. In the beginning, there will be a lot more of non R3 board compared to the new R3 board. But from the looks of it, Arduino people from Italy are really commited with supplying R3 boards. For instance, it is harder for distributor to get previous revision of Uno at the moment. So as R3 board become more prevalence in the market. More buyer will prefer shield that follow R3 revision. Hence, third party manufacturer will be happier to make and supply some. Perhaps by then, there will be a better work around at having R3 shield that work with non R3 board? What is New in R3 Then? There happened to be additional 4 pinout on the board. However 2 of it (SDA and SCL) are duplicate of A4 and A5 pin which also function similarly to facilitate I2C or TWI communication. As for the other two pinout among the power headers. The first one is not connected at all and simply reserved for future design. The second pinout, labelled as IOREF. Is a little bit vague functionality wise. My understanding is that it will allow future shield to check I/O voltage level of the underlying Arduino board, be it 3.3v or 5v. Definitely this will require further investigation. With that said, there are other small changes such as using ATMEGA16U instead of ATMEGA8U. But I am getting ahead of my self. Lets bellow graphic do the talking and have fun! Arduino BT is an Arduino board that already have built in Bluetooth module. This simplify hardware interfacing. When it is up and running it simply act as normal Bluetooth device. Pair it with a PC or notebook, and it is ready to talk to Arduino IDE for programming. As simple as that. There lies the catch. The "When it is up and running part". Arduino BT is using Bluetooth connection. It has no built-in port to accept USB. The catch is that, it is not as easy to power up. Compared to Uno or Duemilanove which is USB powered. So how do we power it up. Arduino BT does come with +ve and -ve terminal. In this article. I am going to demonstrate how to use this terminal to power up Arduino BT using AA batteries. Test it by uploading LED Blink sample program and highlight some possible issue and pitfall along the way. However, please note that this article is not a complete replacement to Arduino BT hardware page. The most important being hardware specification such as maximum voltage. So, do check the page and base your design upon the specification given there. A good advice at this point is to understand that, unlike other board, Arduino BT maximum voltage is specified as 5.5V. So it is very critical to be careful with the power up stage. It is a good idea to use multi meter and double check that batteries or adapters +ve and -ve terminal voltage did not exceed 5.5V. A good point to think about is that power adapter (or wall warts) voltage under load should be lesser than the voltage measured by multi meter on the terminals without any load. But at this moment I'm taking "it is better to be safe than sorry" stance. Will revisit this in the future. 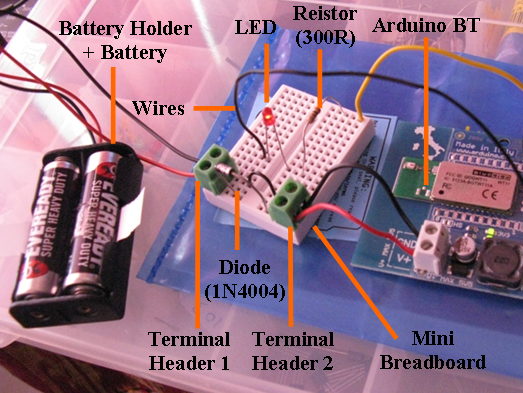 Perhaps continue with another article on powering Arduino BT using power adapter. In Malaysia, AA battery is commonly rated at 1.5V. Having 2 batteries in series give about 3V. Which is enough voltage to power up the board and within spec. However this say nothing about the amount of charge hold by the battery or how long will it last. So here is our first pitfall of the day. And I am a pitfall magnets. Personal experience. Run down 6 AA batteries to death in the half day of troubleshooting. The reason being using normal grade batteries! So dear readers, please use Alkaline batteries. Better yet, use rechargeable batteries! With that said, after initial test is done. I did use 4 AA rechargeable batteries in series . Each of the battery rated at 1.2V with 2100mAH charge capacity. Do be careful not to use 4 AA battery with 1.5V rating. That is 6V and possibly may damage the built in and soldered micro controller. Definitely not user replaceable. Unless the user is very skilled in soldering and desoldering surface mount chip with many small pins. Assemble the simple circuit. Note that diode is to prevent reverse polarity. Still, be careful not to reverse polarity when connecting the second terminal header to Arduino BT. At this point we are not using the LED yet. So leave it unconnected. Good idea to double check the battery voltage using multimeter before going to next step. Connect the circuit +ve terminal (red wires) to Arduino +ve terminal. Connect the circuit -ve terminal (black wires) to Arduino -ve terminal. Battery holder without On/Off switch (as the one used in this article) means that the board will be powered up when both terminal is in contact. Be careful! The board is powered up. There is two on board LED. One is power LED which should be steady on after power is up. The other one is Low Battery LED which will light up when battery is low. Next we are going to pair Arduino BT with a PC or notebook. Simply do the normal platform specific ways to pair Bluetooth device. I am using a notebook with 64 bit Windows for this test. So in Bluetooth panel, click Add Device and wait for it to detect. Initially it will detect it as Other Device. Select it and click next an follow the instruction. A driver will be automatically installed. Hence forth it will be shown as Arduino BT. Important: The pairing must be done from PC or Notebook since pass phrase need to be entered. When asked enter 12345 as the pass phrase. After driver installation is successful and pairing is done. Verify the COM port number. Simply double click the newly added device to look at its property page. Select the hardware tab. The comport number should be displayed. Menu : Tools > Board and choose Arduino BT with the correct microcontroller. In my case it is Arduino BT w/ ATMega328. Menu : Tools > Serial Port and select the correct COM port. Since we already open the Blink sample. 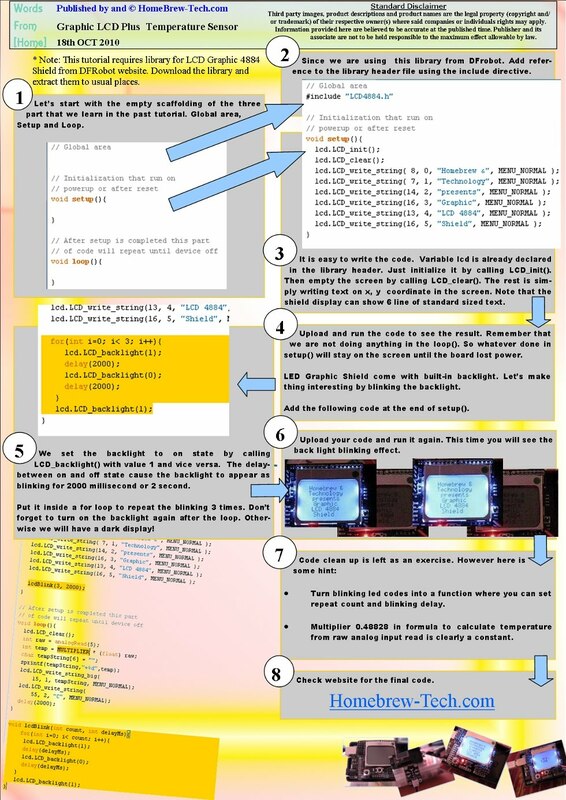 Simply upload the code to Arduino BT. My theory; the error is due to on board Bluetooth module on Arduino BT actively communicate with Arduino microcontroller using RX and TX pin. Arduino IDE also use this RX/TX as serial port to program the microcontroller chip. Hence the error. Apparently not everyone suffer this problem and base on internet search, some manage to solve it by replacing Bluetooth adapter on the PC/Notebook side. Fear not! The work around is to press Arduino BT reset button, release it and immediately (within 2 second) press the upload button in the IDE. Works like a charm! The reason being, boot-loader programmed into the micro controller wait for 5 second for programming serial communication before continuing with other function. Upload is completed, the board reset itself and is running, but where is the blinking LED! Don't panic! Unlike Arduino Uno or Duemilanove. Arduino BT does not come with onboard LED connected to digital I/O pin 13. This is the time to connect LED black wire to GND and yellow wire to pin 13 on the Arduino BT board. If everything goes well, enjoy the blink! Prototype Shield is a very nice addition to Arduino shields (or extension board). It is like a blank piece of paper. This shield is sort of a blank shield with lots of hole for wire wrap and even pads for 28 pin DIP chip and 14 pin SOIC chip. Also very useful are trace of GND and VCC that act as rail for both. Love this as it is easy to test circuit using multimeter as shown by image on the right. It came with mini breadboard that is self adhesive. In case anyone got bored with wire wraps, simply use the breadboard bonded with adhesive on top of the shield or just leave it bouncing around! As a shield it come with standard shield connector. Mostly I found that it is very useful to use jumper wire on the connector. Either connect the digital or analog pins to mini breadboard or one of the wire wrap holes on board. However do be cautious not to short anything when jumping around with the wires on life board! I believe in sharing common pitfall of electronic with everyone. It happen to me twice! Windows just complains about power surge on the USB port (yikes!) and display popup that advice to unplug the cable, reconnect then reset the affected USB hub. In one occasion, I have to restart the notebook to get Uno detected as serial port again. I got one inquiry about how to use the on board bounce switch and LED. The secrete is to know which of the wire wrap hole correspond to the switch and LEDs. Let bellow picture do the talking. With the above information, a mini breadboard, some jumper wires and a pull-up resistor we get the following work of arts! Check the following video and source code after it!